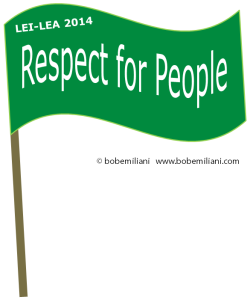 Within the Lean community, 2014 seems to be the year that the “Respect for People” principle finally gained traction. As I reflect back on this, I think about why it took so long for this to happen. And I think about why it has been so difficult for people to recognize the importance of the “Respect for People” principle and how it enables continuous improvement. Since the “Respect for People” principle has been the focus of my work since the early 1990s, I have a unique perspective on its emergence over the last 20-plus years. A substantial portion of the difficulty appears to lie with influential people who for many years ignored or severely discounted the “Respect for People” principle and the critical role it plays in the proper functioning of Lean management. This can be attributed to one or more of the following: a lack of first-hand experience with Lean management practice, incomplete or biased research, simple misunderstandings, or selective presentation of research findings. Whatever the cause, opportunities to help people correctly comprehend Lean management were lost for nearly 25 years – a critical period of time for American business and for American workers. That bit of a sentence shows a stunning lack of awareness of the “Respect for People” principle in Lean management and the process for creating The Toyota Way 2001 document. Careful study the history of Toyota Motor Corporation, Toyota management’s mindset and practices, and the evolution of Toyota’s production system (and of progressive management itself) would reveal that “Respect for People” was not a recent addition to The Toyota Way. 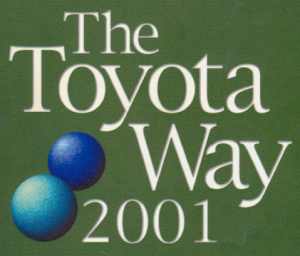 “The most important objective of the Toyota system has been to increase production efficiency by constantly and thoroughly eliminating waste. This concept, and the equally important respect for humanity that has passed down from the venerable Toyoda Sakichi (1867-1930), founder of the company and master of inventions, to his son Toyoda Kiichiro (1894-1952), Toyota Motor Company’s first president and father of the Japanese passenger car, are the foundation of the Toyota production system.” (italics added). Given that “Respect for People” enables continuous improvement, discounting or ignoring the “Respect for People” principle is a fundamental error in comprehending Toyota’s production system. The book, Lean Thinking, by James P. Womack and Daniel T. Jones, is subtitled Banish Waste and Create Wealth in Your Corporation. Perhaps Daniel T. Jones, an economist, was more influential in deciding how Lean should be presented to the public, as a corporate wealth creator for owners and investors, than how James P. Womack, a political scientist, may have wanted to present Lean. Maybe their literary agent or book editor favored the wealth creation positioning in order to sell books to a management audience. It matters little now. What we know is the consequence of that positioning and of leaving out the “Respect for People” principle: large numbers of people were laid off as a result of Lean in the quest for corporate wealth creation. That zero-sum outcome is entirely predictable given the 100-plus year history of progressive management (see REAL LEAN Volumes One and Two). Ignoring the “Respect for People” principle could not have come at a worse time. This was a huge mistake and also supremely disrespectful of people. What happened to workers on the genba between 1990 and 2013 (and to their families, as well as suppliers and communities) was both repugnant and heartbreaking. Rather than acknowledge that reality, it seems to be more palatable to just move on and start waving the “Respect for People” flag. It is only this year, 2014, that Daniel T. Jones has shown a vigorous interest in the “Respect for People” principle, coinciding with the publication of the book Lead With Respect: A Novel of Lean Practice, written by Michael and Freddy Ballé. One would think that the “Respect for People” principle deserves better treatment than a fictional account of how to lead with respect. Click here to read an award-wining non-fiction account of how to lead with respect. While one can always say “better late then never,” one can also say that a massive, multi-year effort is now needed to correct leaders’ understanding and practice of Lean management. Instead of starting in 2014, this effort could have begun in 2001 or much earlier, say, 1990, likely saving many jobs and much family heartache. Can business leaders’ understanding and practice of Lean now be corrected? Do they care? Is it too late? Note: The title Lean Thinking and subtitle Banish Waste and Create Wealth in Your Corporation suggests that the objective of Lean production is to create corporate wealth. According to Taiichi Ohno, the purpose of Toyota’s production system (inclusive of The Toyota Way) was “increased productivity and reduced costs.” Wealth creation was a by-product, not the objective. Hard and sad but just conclusions about Lean misunderstanding. So difficult to get this back on track: no continuous improvement without respect for people and vice versa. How simple can it be stated, but at the same time, how hard is it to achieve.